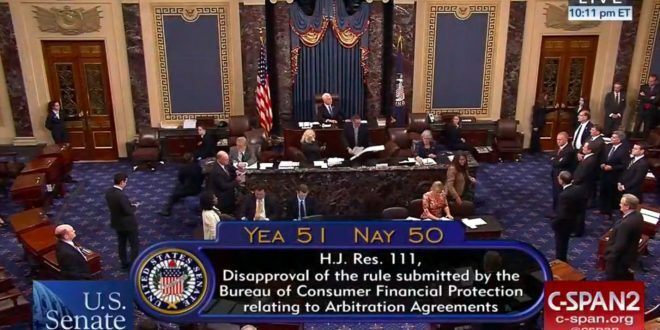 Senate Kills Obama-Era Rule Allowing Consumer Class Action Against Banks, Pence Casts Tie-Breaking Vote - Joe.My.God. Banks, credit card issuers and other financial companies will be able to block customers from banding together to sue over disputes, after the U.S. Senate on Tuesday narrowly killed a rule banning the firms from using “forced arbitration” clauses. Republican Vice President Mike Pence appeared on the Senate floor at 10:11 p.m. EDT to cast the tie-breaking vote as the chamber’s president and approve the most significant roll-back of Obama-era financial policy since President Donald Trump took office vowing to loosen the leash on Wall Street. The final count was 51 to 50. The Republican-dominated House of Representatives has already passed the resolution repealing the Consumer Financial Protection Bureau (CFPB) rule released in July. The resolution also bars regulators from instituting a similar ban in the future. Two Republican senators, Lindsey Graham of South Carolina and John Kennedy of Louisiana, sided with Democrats in opposition to the resolution. Wiping out the rule would affect tens of millions of Americans who often don’t know they are covered by an arbitration clause when they sign up for a credit card, checking account or prepaid card.